All Aboard Florida has closed on the final land it needs to redevelop six blocks of downtown, as nearly 100 workers continue to forge the foundation of a new train station that will bring passenger rail to Miami’s urban core. All Aboard Florida just closed on 2 acres in Overtown, a move that clears the way to construct 3 MiamiCentral, a mixed-use complex that is to bring Class A office space, retail and a grocer to the neighborhood. The property is hugged by Northwest Sixth and Seventh streets and Northwest First Court and Second Avenue. Its neighbor to the east is the Miami-Dade County Administration Building. One of the first tenants at 3 MiamiCentral will be All Aboard Florida, which will relocate its corporate headquarters from Coral Gables to the new site. The plan also promises dedicated parking for the historic Lyric Theater nearby. Addressing an issue that has plagued Overtown for years, 3 MiamiCentral will feature a national grocer, the company said. Hundreds of residents expressed this need to All Aboard Florida executives at a meeting in 2013. The plan calls for a 12-story building that will house a grocer at about 29,000 square feet on the ground floor, nearly 97,000 square feet of office space, 33,161 square feet of commercial/retail space, and a garage to park 1,096 vehicles. It’s perhaps the smallest piece of All Aboard Florida’s full development vision for downtown, which is to see a major train station, MiamiCentral, rise to be a transportation hub connecting All Aboard Florida passenger trains, Metrorail and Metromover, county buses, city trolleys and taxis, and possibly link with Tri-Rail. The major part of MiamiCentral is about 9 acres west of Northwest First Avenue. Work to drill 50- to 100-foot pilings continues today, with 1,587 piles in place and about 40 to go, the company said this week. The transportation hub will also include a mix of uses, with residential, office, commercial and a retail concourse. All Aboard Florida has picked Facchina Construction of Florida for pre-construction and construction-management for 3 MiamiCentral. Construction is to begin this year, and sub-contractor and career opportunities are to be announced in coming months. The complex, to be done in the first quarter of 2017, seeks LEED Silver certification. Others working on 3 MiamiCentral are AECOM, a global provider of professional, technical and management support services in transportation and other markets, which is designing the complex, and Miami-based Design2Form, which is design consultant and bringing knowledge of the history and culture of Overtown to the project. 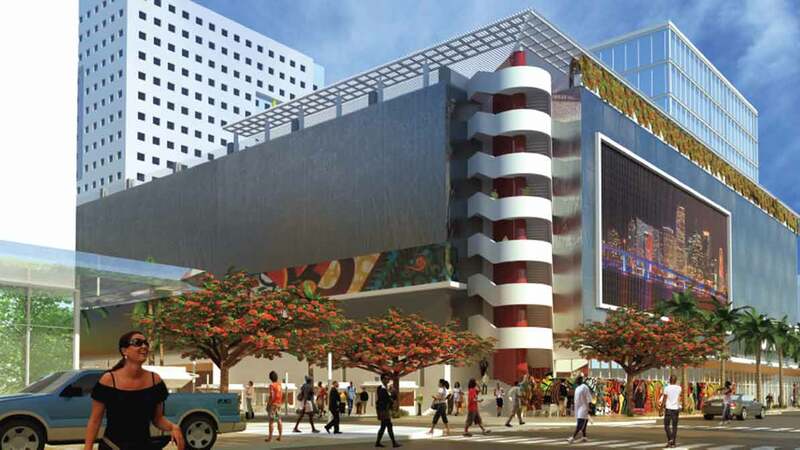 The centerpiece of 3 MiamiCentral is to be a mural by Miami-based sculptor and visual artist Robert McKnight. Many younger people in medium-sized cities around the country are thrilled with the quick progress All Aboard Florida is making. We’re Republican and Democrat, well-off or just regular Joes. A lot more of us use transit than in our parents’ generation. We’re hoping to see good things come out of Florida for passenger rail, transit, and compact community development. Thank you. Re MiamiCentral (not 3 MiamiCentral), will there be some work force housing included? There’s a real need for it in downtown. I hope so but I’m leery because developers usually pay off local politicians to get exemptions from providing affordable housing mandated by law. I can’t wait to be the first to hop onboard. I’ve been waiting for FEC comeback since strike in 1963.